If you are a hopeless romantic, you will surely love Valentine’s Day and you will want everything to be perfect for this special evening. How about some very romantic nails? Here we give you some quick and simple ideas to make you nails look incredible for Valentine’s Day 2018. Keep reading this article if you want to discover the best decorated nails for Valentine’s Day 2018. We do not know what plan you might have for Valentine’s Day but what we are sure is that you want your nails to be perfect for that night. That is why, at modaellas.com, we have decided to bring you a collection of the best ideas of decorated nails for Valentine’s Day 2018. In Valentine’s Day, the predominant colors are red passion and other feminine colors, such as pink and purple ones. 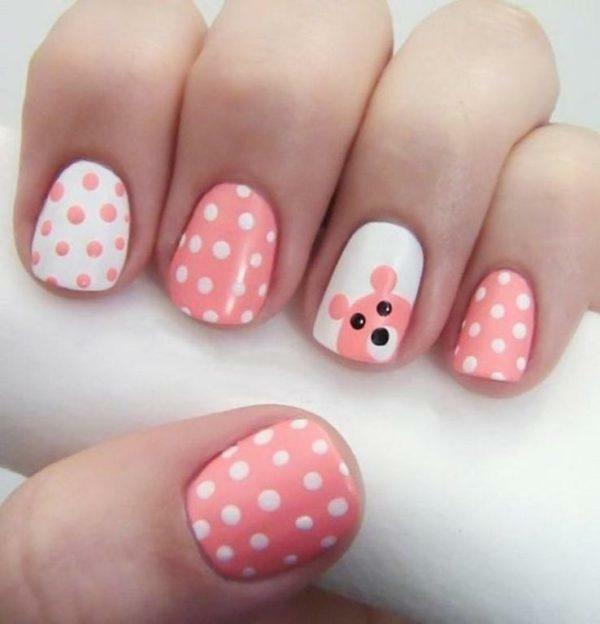 However, we can also skip these rules and make very original nails, with romantic details, but in different colors. For example, here below we leave you a very nice idea of decorated nails for Valentine’s Day 2018. These nails are decorated in black and white, but with details such as hearts and pearls, which will give you the perfect touch for the most romantic night of the year. As for the design of the nails, we can choose many different motifs that represent Valentine’s Day 2018. Although the most classic and sure bet are the hearts, which we will see below. 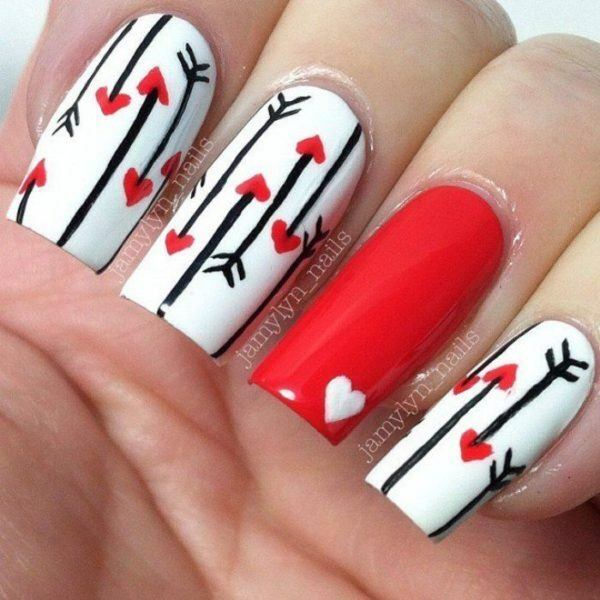 There are many ideas of decorated nails for Valentine’s Day 2018 with hearts, we can also choose other other ideas, such as arrows, balloons, stars or any drawing that can put us in a romantic mood. An idea that we love and we find really original, are the decorated nails for Valentine’s Day 2018 with romantic messages on them. 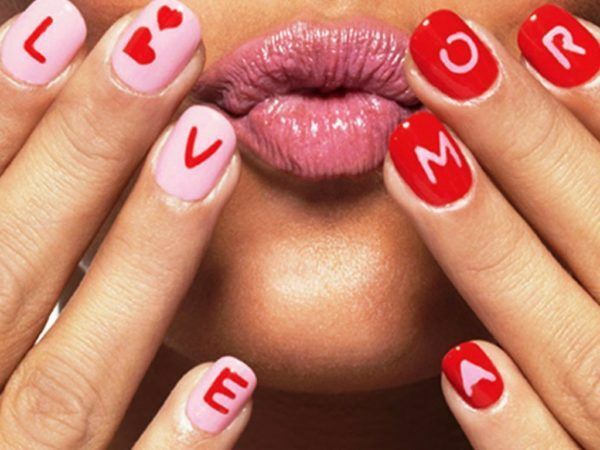 You can draw letters in your nails, like the ones you see below, with very romantic words such as “love” or “kiss”. How about that? It is very original and we can get inspired by many internet sources to choose the letters that we like best! If you are the sweetest, this idea will charm you. You can choose from pastel colors, which are also very romantic for Valentine’s Day, as well as childlike colors to give it a more childish touch. In this photograph they have chosen a coral pastel color and the color white. The perfect touch that gives us the ultimate look for Valentine’s Day 2018, is the teddy bear that appears in one of the nails. It is very easy to do and the results are incredible. For the simplest and classic nail styles, we also have decorated nail ideas for Valentine’s Day 2018. We will not make any drawings, we will only use the best colors for this day and we will also give a festive touch to our nails by applying a little polish with glitter on them. 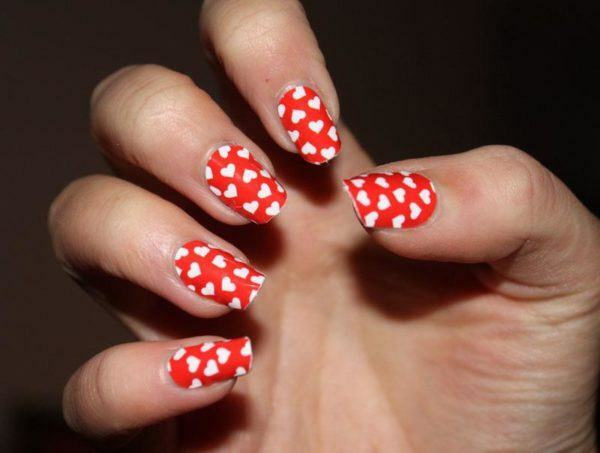 To do the nail style below, you can use many other typical Valentine’s colors, such as red, garnet, purple, or even white. As we’ve mentioned before, one of the designs of decorated nails for Valentine’s Day 2018, are the hearts. We can find all of the colors, shapes and sizes, all perfect for this special evening. Here we show you the best nail designs for Valentine’s Day 2018 with hearts decorations. A very simple and quick idea could be what you see below. Surely it seems impossible to make such small and perfect hearts in your nails, but there is a trick to do so. All we have to do is, first, paint our nails in white and then put some heart stickers. If you do not have these stickers, do not worry, because with a little adhesive and a mold you will be able to make the shape perfectly. We stick the stickers wherever we want to place them and we pass a layer of gloss so that they stick well and will not move. Then we paint the nails red and, when the nails are dry, we remove the stickers of hearts. Finally, we give another layer of gloss to make them last longer and make them more beautiful. If you are looking for decorated nail ideas with a rock vibe for Valentine’s Day 2018, you can choose to wear worn out hearts, like the ones you see in this picture. You can make them in many colors and all you have to do is make the hearts with a good amount of nail polish and then scrape them a little with a nail file. We love this idea because it is very simple and discreet, if we do not want our nails decorated for Valentine’s Day 2018 to draw too much attention. 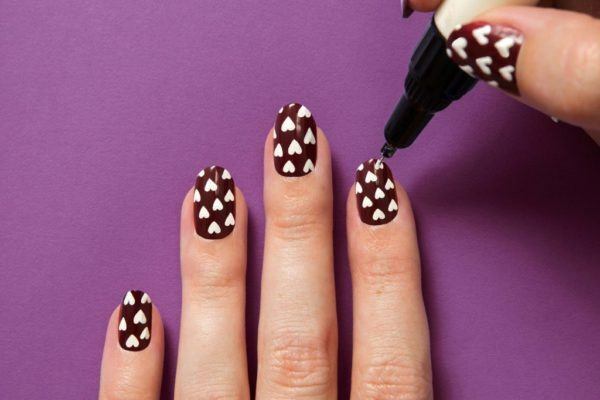 In order to do this, you need to apply a transparent base on your nails, then make two circles with red studs at the corners and go over them with white. Finally finish with another layer of brightness. And following the game of transparent bases, we have this idea that is also very simple and quick to do. 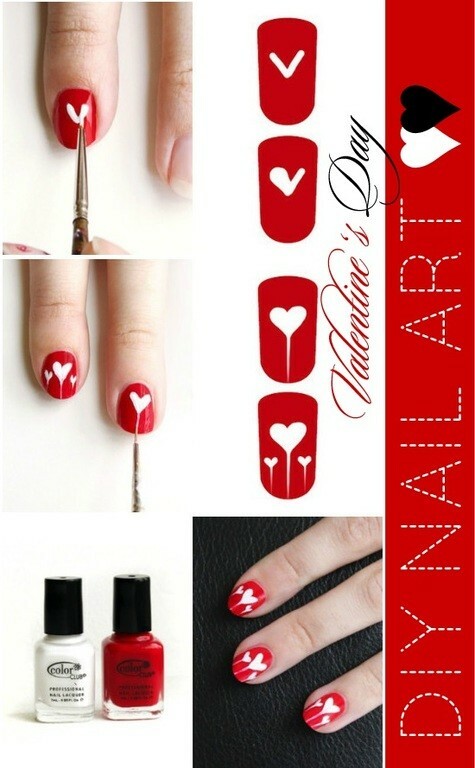 Choose a pair of nails to draw hearts on them and follow our steps. First apply a transparent base throughout the nail. Then place a sticker or tape with a heart shape and paint with red all around. When the nails are already dry, remove the sticker and apply another layer of gloss throughout the nail. Finally, in this section we have selected the easiest decorated nails to do for Valentine’s Day 2018 so you can see how they are done step by step and have no doubt. Follow our instructions and you will have the most romantic and beautiful nails for this Valentine’s Day 2018. The first thing we want to show you is that, in order to do a really nice nail decoration for Valentine’s Day 2018, you do not need too many tools. You can actually use many things that you have at home to help you. For example, in the photograph you see below, we have drawn very cute little hearts. But do you guess how they are made? With tipex! It is very easy to do and very cheap. And if you want to use another color other than the classic white of tipex, you can use a worn tipex and stain the tip with the nail you prefer. Thus, the tipex can be used to draw figures, as it is like a very thin brush. What if we want to make two designs in the same nail? How can we avoid the colors mixing? All you have to do is use a sticker to separate both designs. In this example they have used a round sticker to make a circular shape. Look how beautiful the final result is! Finally, we teach you how to make this beautiful idea of decorated nails for Valentine’s Day 2018. It is a very delicate and feminine design. To draw our ladybug we will need a red or pink polish to paint the body of the ladybug. Then, with a black nail polish, we will make a line in the center of the nail and a circular line at the end of the nail. Then, with black color too, we will make small dots throughout the nail. Finally, with a little white polish we can make the eyes of the ladybug. How about that? It’s super fast!